Blank Slate Books | Blank Slate loves Lambiek! As our very own Kenny Penman declared on Twitter last night, we at Blank Slate are proud to announce that a selection of our titles are now available in Amsterdam via the world’s oldest active comic shop, Lambiek! Chances are you’re already aware of the legendary 43 year old shop by reputation alone, but many more of you will have encountered their enormous online Comiclopedia – set up in 1994 and still streets ahead of Wikipedia in terms of comic info. Currently, the store stocks The Girl and the Gorilla, Psychiatric Tales, Spleenal, and The Accidental Salad, with a complete range to come shortly. Locals and holidaying folk can go grab our books at Kerkstraat 132, 1017 GP Amsterdam immediately, but for those not lucky enough, here’s Amsterdam 360’s astonishing virtual tour of the shop to slam your eyeballs against. 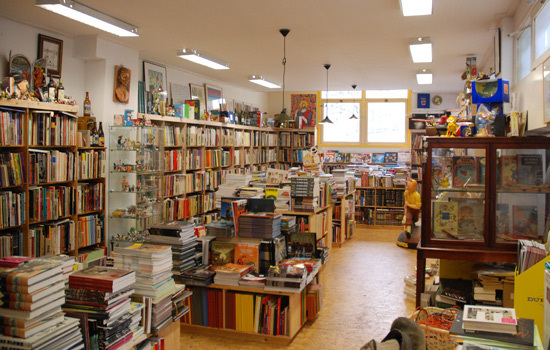 If any Amsterdam locals are reading this, we’d love to see a picture of our books nestled in amongst the other great books Lambiek has on offer!